Olivia Hope © 6 December 2018. Posted in the Magazine ( · Children & Young Adult · Interviews ). 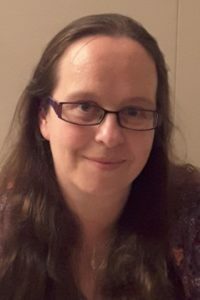 In a second interview from our series on Irish debut children’s authors, Olivia Hope of our Down the Rabbit Hole blog talks to Sinéad O’Hart. Sinéad lives in Meath with her husband and their young daughter. She has had a varied career, having worked as a butcher, bookseller and university lecturer (though not all at the same time). She has a degree in English and History and a PhD in Old and Middle English Language and Literature, because she likes making life easy for herself. The Eye of the North was her first book. 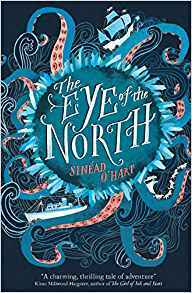 Hi Sinead – many congratulations on having your first book The Eye of the North (Stripes publishing) published in February this year. Thanks so much for talking to me today about what the past year has been like – both leading up to being published and your experiences as a debut author. So, an easy question first – what was your most significant moment in the past year of being a debut author? The most significant moment, for me, was giving an author talk in front of 300 third-, fourth- and fifth-class children in my old primary school in Gorey, Co Wexford, last February. It was significant for several reasons; firstly, because it was (and it remains!) the biggest author talk I’ve given, and I was in my first week of doing school and library events so I was nervous as a very nervous thing; secondly, because it was in my own school, where I spent many happy years in the dim and distant nineteen-eighties, and thirdly because on the way there my publicist at the time, Beth, ever-so-casually broke the news that I would have no overhead projector or PowerPoint (because I tend to rely on whizz-bang presentations to help me feel less terrified), and that I’d be speaking in front of 300 kids. Luckily, she only gave me about three minutes for my panic to build before I had to put my game face on, which was wise of her. It turned out to be, probably, the best author talk I’ve given. I loved every second. How long did it take from beginning your first draft of The Eye of the North to it appearing on the bookshelves? I started to write The Eye of the North as a NaNoWriMo project in 2013, and I finished the first draft in January of 2014. Later that year I secured my agent, Polly Nolan, on the strength of the MS (which I’d edited half to death by then), and she sold it to the US in late 2014. It was published in North America by Knopf Books for Young Readers in August of 2017. Then, the book sold to Stripes Publishing in April of 2017, if memory serves, and it was published domestically in February 2018. I guess you could say four to five years from first draft to finished product? I think I aged about forty years in that time. How did you find working with your editor? Were there any new experiences in publishing that you hadn’t encountered when you were writing and submitting? I’ve been so lucky with my editors. In the US I worked with Melanie Nolan on The Eye of the North, and Katie Jennings, of Stripes Publishing, is my miracle-worker in the UK. I’m also privileged to have Polly Nolan on my team, as she’s a brilliant editorial agent. She worked as an editor before she was an agent, and when The Eye of the North was going on submission she helped me edit it – and she was brilliantly, incisively, perfectly ruthless. She shaped the MS so expertly before anyone from a publisher saw it that the edits after that were a breeze. Every editor I’ve worked with has had one thing in common: they’ve all seen exactly what I’m trying to achieve, which is an amazing thing. It’s incredible to watch your book change with every edit into the thing you wanted it to be in the first place, but which you might not have been able to do on your own. I noticed this most particularly with my second book, The Star-Spun Web, which took shape, edit after edit, under Katie’s expert care. I had expected editing to be about condensing things, making your text shorter, making sure it didn’t have too many commas in it and that type of thing – I hadn’t understood how malleable texts are while they’re being formed, and how vital an editor can be to that process. It’s been a fascinating thing to learn. How has your writing changed since you have been published or do you find you have become more confident in your voice in the last year? Has it influenced how you have approached writing your second and subsequent titles with your publisher? Well. This is a hard question to answer, because it’s going to sound contradictory. I’ve both become more confident in my voice since my first book came out, while at the same time writing a second book which (in its first draft) I knew was an unmitigated disaster. I’m not quite sure how those two things balance, in my head! I wrote my second book three times over the course of the past ten months or so, each draft coming closer and closer to what I wanted the book to be – and then, after some absolutely spot-on advice from Katie Jennings, I ‘found’ the voice, and also the form the story needed. After that, everything clicked into place and writing the book for the third time was so much easier; it flowed, just as writing The Eye of the North had flowed. I had been beginning to lose my confidence, but with the final drafts of my new book I rediscovered everything I love about writing. It was a joy once again. Writing a second book is hard, because you’ve got a deadline and you don’t have the luxury of taking your time or experimenting with things like plot quite so much, but it’s also an exhilarating reminder that you’re a professional writer who can produce work on time, to your editors’ requirements, and that it’s something which not only gives you joy but which you’re good at. I wish I could bottle that feeling sometimes, for when things get tough. What has the experience of receiving reviews been like? I try to remember that once my book is out there in the world, it’s not mine any more. It belongs to everyone who reads it, and everyone is entitled to their opinion on it. It does sting a little to receive bad reviews where you feel the reader has missed something in the plot, or where they say something doesn’t make sense when you know you’ve explained it; I try to think of that as a failure on my part to make something clear, and I strive to do better next time. I’m a bit weird, though. I tend not to believe the praise in really good reviews, and I try to learn from the bad ones, so overall the experience of receiving reviews is a bit like being in school! Promotion is a huge aspect of a writer’s first year – what tips and tricks did you discover helped you spread the word about your book? Being on Twitter is the best thing I’ve ever done for the promotional and networking side of my writing career. If I could give anyone advice, starting out, it would be to create a Twitter profile and follow anyone who you find inspirational – writers, agents, publishers, booksellers, book bloggers, reviewers, teachers, whoever. Over time, I’ve built up an online family who’ve supported and cheered me on, every step of the way, and who’ve helped to publicise my books, giveaways, and writing news. I’m not much good at the real-world side of promotion; I get nervous going into bookshops and announcing myself, for instance, and that’s something I need to get better at, but online I find once you build your tribe (and give back as much, or more, support than you get) that you’ll never lack for willing friends to help promote you. Thanks, everyone! And finally, what advice have you for writers who have just received their first acquisition or just signed with an agency? When you sign with an agent: give yourself a massive pat on the back, as you’ve made it past the first hurdle – and it’s a hurdle that most people don’t reach. The period between your agent sending your book out on submission and getting the email or phonecall to say it has been acquired is the absolute pits. There’s no getting around it. So, self-care is important! Allow yourself to wallow and be anxious, but never give up hope. Don’t take rejections personally: you’ll be receiving so many you’ll eventually lose count. And always remember it doesn’t matter how many people say ‘no’ – it just takes one publisher to say ‘yes’. Then, once you’ve been acquired: don’t expect things to happen quickly! Patience is key, as publishing can be slow. Remember editing is a conversation, and you don’t have to accept all your editor’s suggestions (but do also remember they are seasoned professionals who know books and the market better than you ever will, so maybe take your time before telling them to stuff their corrections). And finally, allow yourself to enjoy the journey. You’ll only be a debut once, and you deserve to celebrate your incredible achievement. 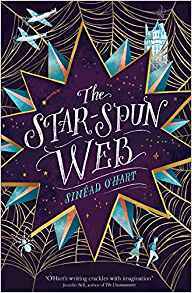 Thanks so much for your time, Sinéad – we really look forward to reading your next book The Star Spun Web (Stripes publishing) in Spring next year. Olivia Hope is a children’s writer from Killarney, Co. Kerry. She was once an international athlete, has been a teacher of all subjects; from English to ice-cream making, and has worked in a variety of scenarios from nurseries (plants and children, although not at the same time unless you count the daffodil incident) to nursing homes. She is unreasonably fond of cheese, French Fancies and is prone to cartwheels. She writes for all ages and her picturebook Be Wild, Little One will be published by Bloomsbury in 2019. Follow her on twitter @OliviaMHope. Published 7th February 2019. Pre-order your copy online here.